Marshall Exteriors features and installs quality roofing materials supplied by GAF Materials Corporation. 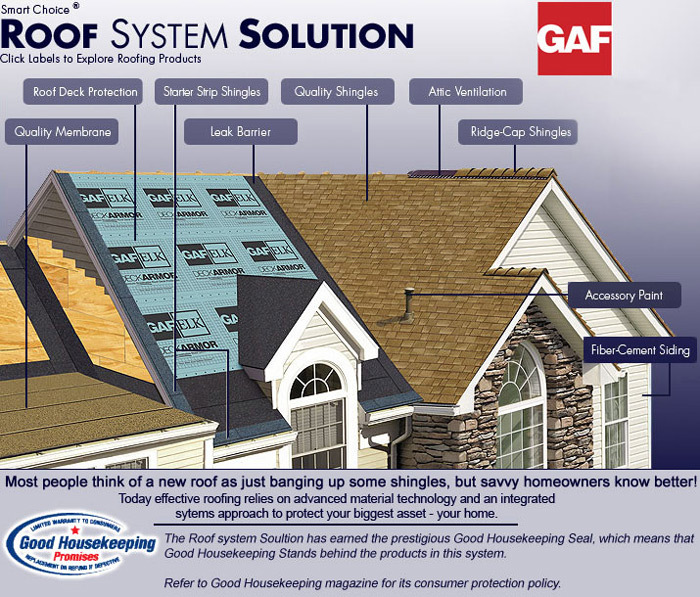 GAF is North America’s largest manufacturer of residential and commercial roofing products.
. . . approaching $3 billion in annual sales! We offer repairs for Homeowners and Real Estate Agents. In warm weather, inadequate ventilation will trap hot air in the attic, causing air conditioning systems to work harder, or leaving your home's interior hotter and less comfortable. Attic Ventilation: In both hot and cold weather, insufficient attic ventilation may cause moisture in the attic to become trapped and condense on the rafters. This condensed moisture can drip down onto the insulation and reduce its effectiveness. Excessive energy costs can result. Asphalt- A bituminous waterproofing agent used in various types of roofing materials. Cobra®- GAFMC’s respected brand name for ventilation products. Country Mansion® & Country Estates™-GAFMC’s limited lifetime warranty shingle. Cupping- When shingles are improperly installed over an existing roof or are over-exposed, they form a curl or cup. Dubl-Coverage® Mineral Guard- Roll roofing material with 19" selvage edge for double coverage over roof deck. Eaves- The roof edge from the fascia to the structure’s outside wall. In general terms, the first three feet across a roof is termed the eave. FHA-The Federal Housing Authority. Sets construction standards throughout the U.S.
High nailing- When shingles are nailed or fastened above the manufacturer’s specified nail location. Ice Dam- When a snow load melts on a roof and re-freezes at the eave areas. Ice dams force water to "back-up" a roof and cause leakage. "L" flashing- Continuous metal flashing consisting of several feet of metal. Used at horizontal walls, bent to resemble an "L". Laps- The area where roll roofing or rolled underlayments overlap one another during application (see also side laps and end laps). Nail-guide-line- Painted line on laminated shingles, to aid in the proper placement of fasteners. Nesting- Installing a second layer of shingles aligning courses with the original roof to avoid shingle cupping. NRCA- The National Roofing Contractors Association. Respected national organization of roofing contractors. OSB- Oriented Strand Board. A decking made from wood chips and lamination glues. Over-exposed- Installing shingle courses higher than their intended exposure. Step-flashing- Metal flashing pieces installed at side-walls and chimneys for weather-proofing. Transitions- When a roof plane ties into another roof plane that has a different pitch or slope. Valleys-Area where two adjoining sloped roof planes intersect on a roof creating a "V" shaped depression.